Results availability Always, as long as stack telemetry is enabled Should be explicitly started CPU usage estimation is ideal for analysis of anomalies such as CPU spikes, especially those which has already happened, so you do not need to turn CPU sampling or tracing on and try reproduce the spike. 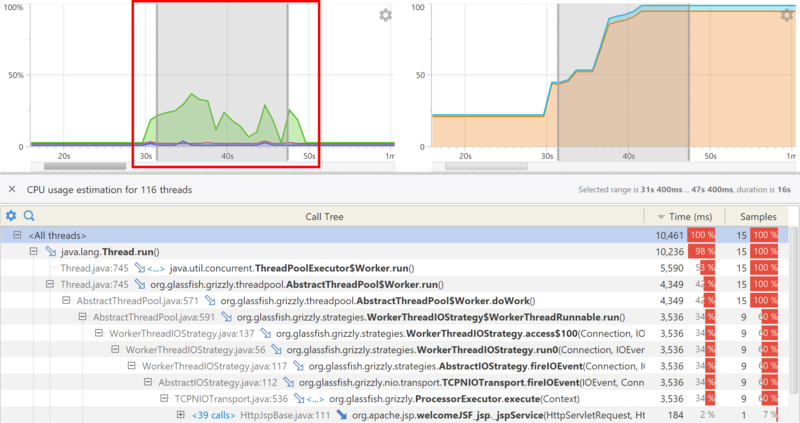 CPU usage estimation is based on thread telemetry, whose frequency is normally as low as 1 sample per second (can be changed using the startup option telemetryperiod). So, it suits for measuring events or method calls that last at least several seconds. If the measured event or method call is long enough, the estimation will do its job - locate problematic code responsible for the CPU spike. For measuring shorter events or methods, use normal CPU profiling, or decrease the telemetry period using the startup option telemetryperiod. CPU profiling results are aggregated since CPU profiling has been started. It is not possible to "extract" CPU profiling results for a smaller time range within one snapshot. However, you can choose which method calls to analyze.